A pretty-as-a-picture village just outside of Ooty, Pykara is a great place for a one-day trip or a chilled out picnic. Ride the waters of an emerald green lake, explore pine forests, and take in the serene hills while you are here. Commercialisation has caught up with Ooty in the past few years. And it can get pretty messy and off-putting. However, it is a great base from where you can explore its more serene surroundings. On one end, there’s Coonoor, on another, there’s Pykara. 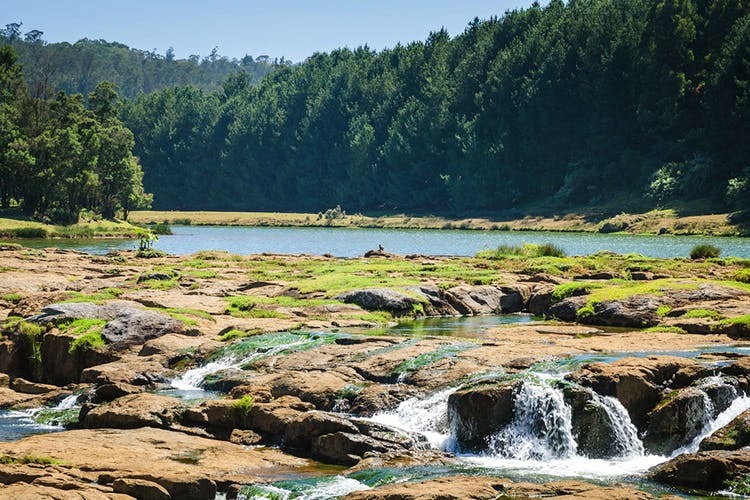 You can hire a taxi or an auto to explore this lovely spot around 30 minutes from Ooty. On your way there, you’ll pass through hills that are untouched and make for great picnic spots. You can pack a basket from Ooty itself and this is a great option since there are not many restaurants around here. The best time to head to Pykara would be on a quiet weekday since the attractions here do get crowded with tourists. While here, do stop by Pykara Lake. Yes, it’s a crowd favourite but the lovely lake that’s surrounded by wooded area makes for a great sight. You can sign up for a boat ride here and venture out into the waters. Keep your eyes open for fish that pop their heads out of the water for a second to say ‘hi’ or avian life. Another hotspot here are the gentle Pykara Waterfalls. These are more of a cascade than a full-blown waterfall. While you are prohibited from entering the waters, you can sit around watch the waters make their way or catch a sunset. Not far from here, you can also stop by a pine forest or a trek up a hill where the stars of many a Tollywood epic have romanced.